How very different are the gifts and ministration that are conferred on each believer by the Holy Spirit. 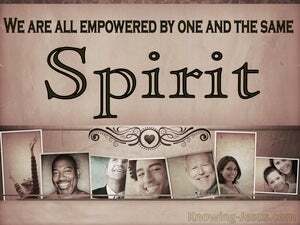 Each Christian is a member of Christ’s body and each is uniquely empowered by the Spirit to perform his own special ministry, which God has foreordained for each of us to do - to His praise and His glory. 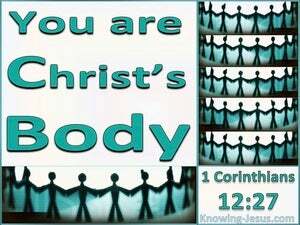 The human body consists of many different components, but it is one unit. There are many hidden internal organs and a multiplicity of visible external members. Each has its own, unique function and yet every single body-part needs to interact with every other member, and work together synergistically, in order to maintain a strong, healthy, functioning body. This verse is in a passage concerning the use and abuse of spiritual gifts, where Paul moves into an examination of the Christian Church and an explanation of our membership in the body of Christ. 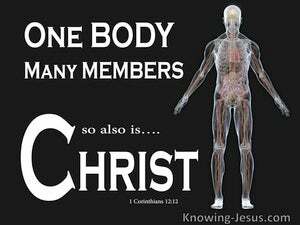 He wants to show that each member of Christ's body is unique in the sight of God and that this complete company of believers is God’s chosen vehicle on earth, through which He makes Himself known to man. 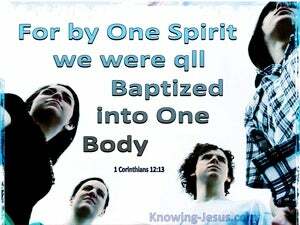 As one reads through this epistle to the Corinthian Christians, it is evident.. that although these saints were enriched in all the gifts of the Spirit, they were demonstrably deficient in the fruit of the Spirit. They were not growing in grace and in a knowledge of their Lord and Saviour as God desires, but were regressing in their spiritual growth and maturity back to infancy, to their great shame.